On Saturday, the fourteenth of January, 1956, many people throughout New Castle stopped to admire an unusual circular rainbow that hung around the sun above Lawrence County, a creation of the cold and frosty air. Fewer noticed Paul Conner as he drove south from Sharon through New Castle and onward, stopping at every department store and supermarket on the way to cash hundreds of dollars-worth of bad checks in the name of Joe Garrett. Paul was heading for his home in Bellevue, in Allegheny County, but his trip was cut short when the manager of the Montgomery Ward store in Beaver Falls recognised him from a previous visit and called the police. He ran out of the shop but was chased and caught. Paul waited in Beaver Falls jail while the various jurisdictions discussed where he should be dealt with first. New Castle won the argument, and he was taken there on the seventeenth of January. There is no further record of his case or of Paul himself. 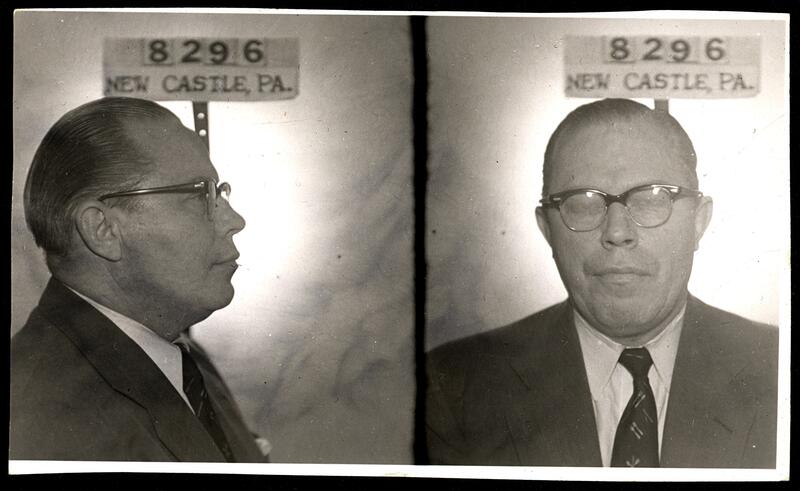 Sources: New Castle News (14 Jan 1956, “Pa Newc Observes”; 17 Jan 1956, “Alleged Forger Taken To Sharon”; 18 Jan 1956, “Spurious Check Charge Placed Against Connor”). interesting story. i am betting that this wasn’t the first time this fellow pulled this stunt. look at how he closes his eyes almost always a sure sign of an experienced criminal. id and fingerprints weren’t as deadbang in terms of timing and comprehensive accuracy ie manual fingerprint pulls instead of a computerized search. Wise words to live by. I like the story of how he got $5k from Al Capone.